By the Bronze Age, around 2000 BC, people in northern India were richer, because they were trading more with West Asia and Central Asia. They could afford to build cities. And they could afford to make more expensive art than their Stone Age ancestors at Mehrgahr. 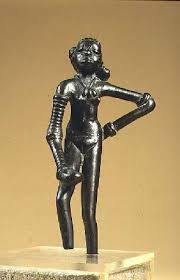 Harappan artists made bronze statuettes (little statues) like this dancing woman. She’s totally Indian. She’s way more of an independent person than any women in West Asian art at this time. 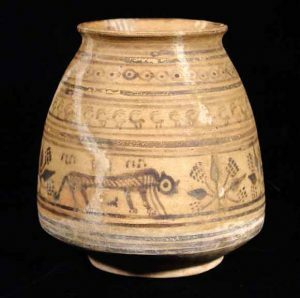 Harappan artists also made pottery decorated with painted rows of flowers and animals, like West Asian pottery. They carved small stone statues, too. Did you find out what you wanted to know about Bronze Age Harappan art in India? Let us know in the comments! Eyewitness India, by Manini Chatterjee (2002). Easy reading. It’s not specifically about Indian art, but you’ll find information about Indian art in this book. Cite this page: Carr, K.E. Harappan period Indian art. Quatr.us Study Guides, July 19, 2017. Web. April 24, 2019.